Curity Ultra Fits Baby Diapers, manufactured by Kendall, are highly absorbent diapers that are gentle on babies skin. Curity Ultra Fits Baby Diapers comfortably protect your babies from leaks and accidents; especially effective for overnight protection. The Rapid-Dry core locks away odor and keeps moisture away from the skin to prevent rashes and chafing. The cloth-like backing not only is breathable and soft, but also provides extended protection all night against leakage. 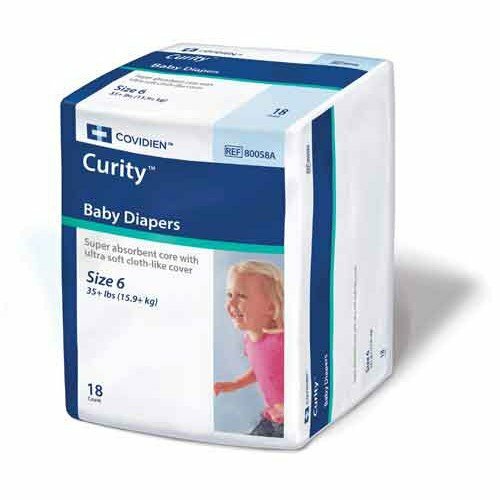 Curity Baby Diapers fit snugly with resealable tabs for easy inspection. You'll quickly trust Curity Ultra Fits Baby Diapers with helping your baby stay clean and dry. Size Limit: 8 lbs. - Over 35 lbs.